The JSE managed to close firmer on Monday mainly on the back of rand hedge stocks which advanced due to a softer rand. The local bourse shrugged off the relatively mixed economic data out of China which showed that the world’s second largest economy grew at its slowest pace since 2009. European stocks traded mostly weaker due to this data, however on the JSE strong gains from blue chip stocks mitigated the potential downside to the local bourse. Chinese GDP YoY grew by 6.4% which was less than the forecasted 6.5%, further highlighting the concerns investors have shown due to the ongoing trade war. Retail sales and industrial production numbers did come in better than expected which perhaps helped to soften the negative impact from the weak GDP numbers. 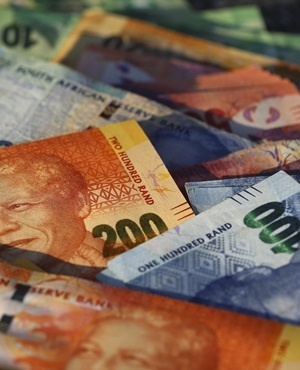 The rand weakened to a session low of R13.90/$ mainly on the back of a stronger US dollar which has staged a significant recovery over the past week. At 17.00 CAT, the rand was trading 0.13% weaker at R13.86/$. On the JSE, Sappi [JSE:SAP] was buoyant as it gained 3.9% to close at R77.08, while British American Tobacco [JSE:BTI] firmed to R459.98 after gaining 2.5%. Index heavyweight, Naspers [JSE:NPN] climbed 3.34% to R3164.85 after its Hang Seng listed associate managed to close firmer. Reinet Investments [JSE:RNI] added 2.85% to close at R213.27, Richemont [JSE:CFR] closed 1.91% firmer at R96.34, and Mondi [JSE:MND] closed at R327.67 after adding 1.81%. Imperial Logistics [JSE:IPL] closed amongst the day’s biggest losers after the stock lost 1.65% to end the day at R70.30. Gold miners also struggled as the gold metal price remained subdued. Harmony Gold [JSE:HAR] lost 1.73% to close at R23.85, AngloGold Ashanti [JSE:ANG] closed 2.12% weaker at R166.02, and Gold Fields [JSE:GFI] dropped 0.75% to R49.16. Dis-Chem Pharmacies [JSE:DCP] pulled back by 2.84% to close at R26.04, while sugar producer, Tongaat Hulett [JSE:TON] closed at R51.00 after dropping 2.39%. The JSE All-Share index eventually closed 0.56% firmer, while the JSE Top-40 index added 0.69%. The Financials index came under mild pressure as it shed 0.4%, however the Industrials and Resources indices gained 1.56% and 0.26% respectively. At 17.00 CAT, Platinum was down 0.12% at $796.74/Oz, Gold had lost 0.18% to trade at $1279.76/Oz and Palladium had lost 1.39% to trade at $1362.21/Oz. Brent crude traded fairly mixed as it reacted to Chinese economic data. The commodity was trading 0.32% firmer at $62.90/barrel just after the JSE close. At 17.00 CAT, Ethereum was down 1.34% at $117.96/coin, while Bitcoin had lost 0.2% to trade at $3 581.50/coin.